Are you an experienced pet owner with room in your heart and home for pets in need? Become a Connecticut Humane Society foster volunteer! 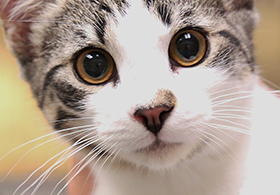 You’ll temporarily care for CHS pets in your home until they’re ready for adoption. You provide the love and care. We provide everything you need to do that! Foster pets are some of the most vulnerable, including those who are sick, injured, too young for adoption, or in need of extra socialization. Step One: Learn more about fostering pets by reading the Frequently Asked Questions about Foster Care. Step Two: Complete the Foster Care application for the CHS location closest to you and submit a photo of the area in your home where you’ll be housing your foster pet. Once you submit the application, you’ll be prompted to submit a photo by e-mail. CHS Newington Foster Care Application. Now accepting applications for volunteers who can foster large breed dogs, infants who require bottle-feeding, volunteers with vet tech experience or experience managing diabetes and other medical conditions, volunteers with whelping experience and volunteers with dog training and behavior modification experience. CHS Westport is not accepting applications for new foster families at this time. Please check back at a later date. Step Three: Selected applicants will be invited in for a volunteer interview. This is a chance for us to get to know you and for you to learn more about the foster care program. The interview helps us both to determine if the program is a good fit. Step Four: Attend a general orientation and foster care training. Get acquainted with CHS and learn how you’ll play a role in the CHS mission. You’ll be given a Volunteer Handbook and asked to sign the liability waiver. The training will cover everything you need to know about fostering pets in your own home. Step Five: Get started! Once you’ve completed the training you’ll be able to foster your first “house guest”!